Move over, dinner! There’s a new mealtime that’s front and center. It’s brunch, and it can be just as creative, dynamic and lucrative as evening service. Although supper has been long considered the principal meal on the dining scene, restaurants have recently turned to those oft-overlooked morning hours to keep tables turning, as well as profits maximized. Professional kitchens aren’t just throwing eggs in a pan; chefs are giving mornings more street cred by pushing the envelope with creative preparations. The result is beneficial for both kitchens and their diners. Breakfast for dinner? These days, it’s the other way around. Bacon-and-egg platters have given way to the likes of lavender-infused French toast, a mainstay at San Francisco’s Mission Beach Cafe. “People come back for the breakfast here, which is classic America, but with a twist of seasonality and freshness,” explains Ron Silverberg, executive chef at the restaurant. Despite their recent rock-star status, both bacon and eggs are still wildly popular brunch ingredients  now they’re just being featured in cutting-edge ways. At Trés at the SLS, Executive Chef Jorge Chicas offers a Cuban-inspired fried egg dish of quail eggs prepared sunny side up, served with crisped rice, banana purée and a classic sofrito. For Laurent Katgely, Chef and Owner of Chez Spencer, the twist on morning meals arose out of his longing for quintessential French egg dishes, many of which weren’t available on local menus. Katgely, who offers a classic omelette aux fines herbs on his menu, wasn’t thrilled with the existing offerings. “For me, the omelets here [in America] are way overcooked; they’re not folded properly,” he remarks. Breakfast and brunch have long been associated with diners and greasy spoons, not to mention a market oversaturated with French toast, eggs over-easy and sub-par mimosas. This roster of standard morning fare certainly wasn’t whetting most food-discerning appetites, that is until chefs began taking breakfast and brunch offerings to a new level with sophisticated preparations and high-quality ingredients. “I had no desire to do pancakes or scrambled eggs,” Russell Moore, Chef and Owner of Camino, admits. “It’s just not interesting to me, and at our restaurant, we only cook stuff that we like.” During midday Saturdays and Sundays at the Oakland restaurant, this includes wood-baked oven eggs with herbs and cream and stone-ground oats with brown butter, walnuts and maple syrup. For Cavallo Point’s Executive Chef Joseph Humphrey, the brunch offerings at his restaurant Murray Circle such as “sopchoppy” grits and eggs, bring back nostalgic memories. “Brunch has been the one meal period we do where I’ve brought out my Southern heritage. It started as my memories of weekends when I was a kid, and the things that my mom would make. Mornings and early afternoons remind me of that time, so I started putting our take on some of those dishes,” he says. Spencer Lomax of Snooze, a Denver-based morning eatery expanding to San Diego, emphasizes that his creativity stems from the desire to savor that moment’s peak tastes. “Seasonal flavors help to inspire menus as we strive to reinvent what can be served for breakfast,” he says. Exhibit A: the restaurant’s Spring Garden Benny, with a ragout of asparagus, greens, wild mushrooms, and leeks, served atop toasted ciabatta spread with a thin layer of truffled white bean pureé, then topped with poached Niman Ranch cage-free eggs and a cream cheese hollandaise. According to Matthew Dolan, Executive Chef at Twenty Five Lusk, the key is to have items that are “just identifiable enough,” like his take on a seafood benedict with lobster and prosciutto standing in for the more commonplace crab. 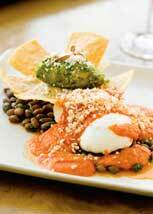 Ethnic foods have also found their voice on new American brunch menus. At Mesa Grill Las Vegas, Executive Chef Bobby Flay features his own twist on Mexican chilaquiles with white cheddar cheese and tomatillo sauce, as well as a Southwestern-inflected crispy bacon and hash brown quesadilla. There are plenty of benefits to serving brunch, like increased revenue from an additional meal service. “You have a restaurant that you’re already paying the rent on, and you’re creating an additional profit for it,” Silverberg says. A lower price point is the first draw. “For guests, brunch is a lower-cost way for them to enjoy what we do,” says Humphrey. Daytime hours also help to expand appeal, by tapping into a different part of the restaurant market. “We never intended to be a really fancy restaurant, but somehow people had that impression,” says Moore. He adds: “I thought, if we have a more inexpensive meal at brunch, it might bring new people in.” And even though Camino has to artificially depress its prices for brunch, it’s worth it: “Most of the people who come for the brunch come back for dinner down the road,” he adds. Still, it’s important to understand the mealtime and its competitive landscape. First and foremost, this means understanding the clientele. One thing to keep in mind: brunch is predictably unpredictable. “Most people are used to making a reservation for dinner,” Humphrey says, “but 75 percent of our brunch is walk-in business. It’s difficult to plan for, and there’s less control over seating or pacing. You have to be smart about it.” For his staff, this means taking care of certain details, like splitting biscuits, in advance.